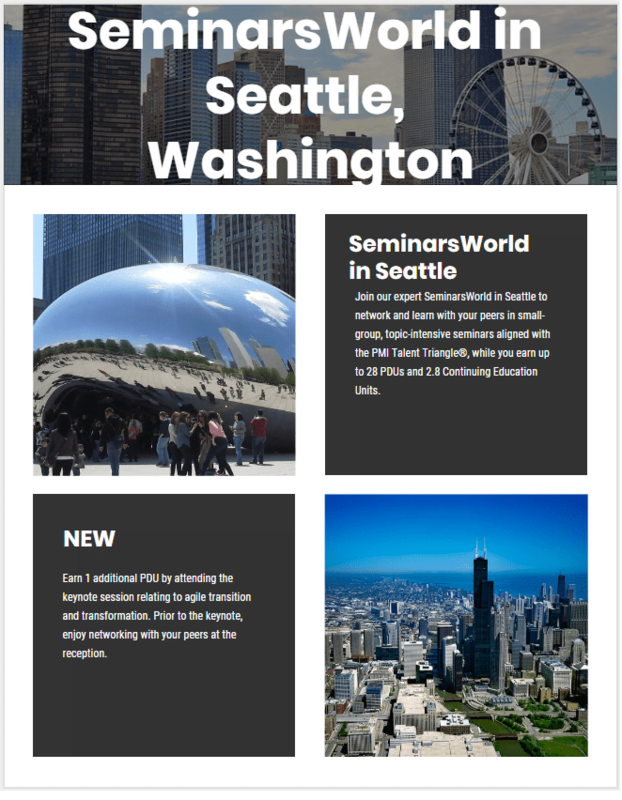 Join our expert SeminarsWorld in Seattle to network and learn with your peers in small-group, topic-intensive seminars aligned with the PMI Talent Triangle®, while you earn up to 28 PDUs and 2.8 Continuing Education Units. Register by 26 February for early bird rates, and through 19 March, save on guest rooms at the Crown Plaza Hotel Seattle—Downtown. Registration includes continental breakfast and lunch. SeminarsWorld runs from 8:00 a.m. – 4:00 p.m.
NEW: Earn 1 additional PDU by attending the keynote session relating to agile transition and transformation. Prior to the keynote, enjoy networking with your peers at the reception. Keynote SpeakersPMI presents John Maher and Bill Bear as the keynote speakers for SeminarsWorld in Seattle! Tuesday, 10 April at 5:00 p.m. Most agile assessments make primary use of questionnaires and spreadsheets to determine a client’s capability to adopt agile. These instruments can be valuable, but can often miss obtaining an understanding of the organizational ecosystem in which we’re introducing agile. In a recent engagement, we used a “Whole Systems” approach that enabled us to identify and surface organizational issues that would not be captured with spreadsheets, including structure, leadership, performance management, history, and culture. The depth and extent of the Whole Systems approach enabled us to craft a transformation roadmap with the client that encompassed all aspects of the organization and is enabling a full enterprise agile transformation. This presentation will describe the difference between transitional and transformational change, our approach, sample findings, and how the approach is enabling our client to take their own whole systems approach to their transformation to agile.